Adolfine Tönnies was born on January 7, 1862 in Horst-Emscher (Westphalia, Germany). She was the third of eleven children. Deep faith and love for the poor characterized her mother Matylda. Her father Johann owned an iron shop and was respected especially for his honesty in business. Adolfine went to a teacher's training college in Münster and at age 19 became a teacher in a one-room mission school in Rendsburg, where she worked with great dedication for ten years. Adolfine had often thought about joining a religious congregation, but did not want to abandon her school. When she asked her uncle, Fr. Hermann Wegener, SVD for advice, he directed her the new congregation of Missionary Sisters that Fr. Arnold Janssen, SVD had founded. On April 4, 1891 she gave her last lesson in Rendsburg and on May 1 moved to Steyl. Adolfine became one of the first 16 postulants in the new religious order. She gladly put up with the poverty of the house and later stated: I believe I have never laughed so much as in the first year of my religious life. Like the other Sisters she did the simplest house chores. She also played the harmonium for the community and lead the singing. When Adolfine became a novice on January 17, 1892, she received the name Michael. Sr. Michael made her first profession of vows with the first group of Mission Sisters on March 12, 1894. In 1895 she was among the first Sisters appointed for Togo, West Africa, but before she could leave the appointment was revoked. In the fall of 1896, Sr. Michael applied for the cloistered section that was about to be established and was accepted. On December 8, she received the habit of the cloistered Sisters and the name Mary Michael. She was a novice again. During her first year as a cloistered Sister, Sr. Mary Michael was novice directress. On December 8, 1897, Fr. Arnold appointed her superior of the community. As superior, she promoted the interior and exterior growth of the Congregation and counseled the Sisters to do ordinary things extraordinarily well. Our salvation and sanctification consist in fidelity in little things. Later, she would be elected superior general of the Congregation, an office she exercised until her death. Mother Mary Michael and three other Sisters made their first temporary vows as Cloistered Sisters on December 8, 1899. On August 15, 1907 the first perpetual profession took place: Mother Mary Michael, Sr. Mary Gertrudis, and Sr. Mary Theresia vowed themselves forever to their Bridegroom at a ceremony presided over by the Founder Fr. Arnold. Mother Mary Michael had spent eight months as a postulant, two years as a novice, and two years as a professed member of the Missionary Sisters. Then she started climbing the religious ladder again: three years a novice and seven years in temporary vows before making her perpetual profession as a Holy Spirit Adoration Sister. For Mother Mary Michael, faithfulness to the spirit of the Founder was the most precious inheritance and greatest concern. 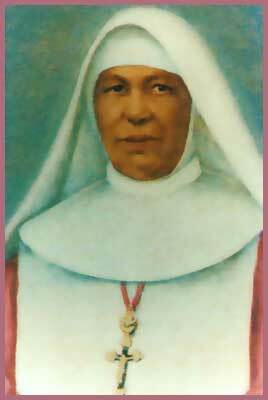 In an address to the Sisters, she said: Whoever is faithful to the principles of our Congregation, our holy rule, and our customs, she has the right goal in view and has everything to become holy. Mother Mary Michael was characterized not only by a great desire to glorify God and to love Jesus in the Eucharist, but also a great missionary zeal. Hence with genuine joy she accepted invitations to open new houses of Eucharistic adoration. By her own example, she taught the Sisters humility, obedience, and cheerfulness. Even in her old age, she was known for the joy she exuded.